As part of our Mother’s Day series, let us tell you about a beautiful bespoke ring made recently where a Mum is truly centre stage. A few months ago, a customer came to us with a specific project in mind. She had a significant birthday coming up and she wanted to commission a piece for this particular celebration in life. 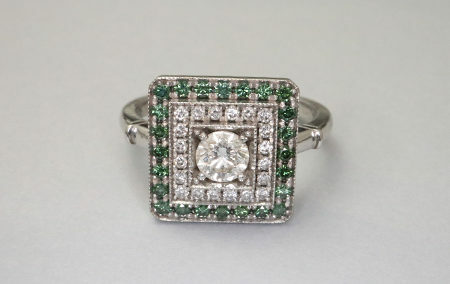 Very generously, her Mum had given her a round brilliant cut diamond from a ring of her own. 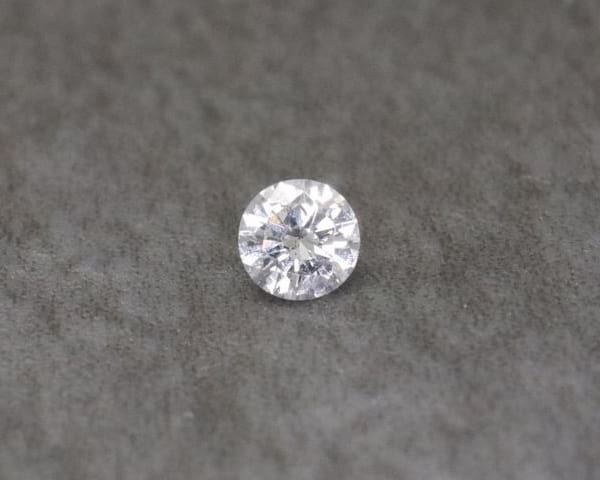 This beautiful 0.33ct diamond was to be set in the middle of an incredible Art Deco style ring! 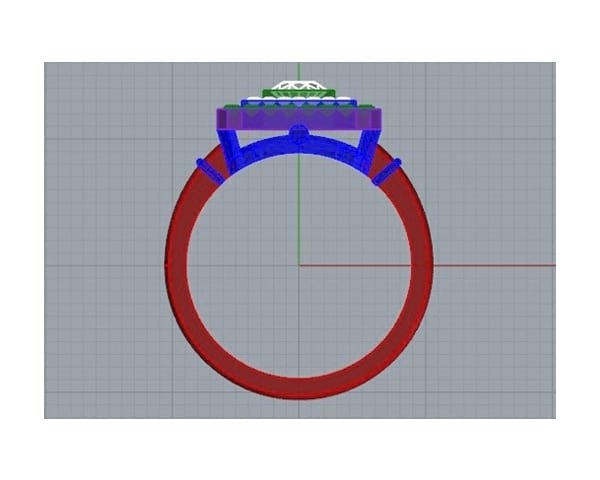 Inspired by design from approximately 100 years ago, our customer had studied many images online and had a very good feeling for how she wanted her new ring to look. We sat down with her and went through various details in order to make sure the final piece was going to be everything she ever hoped for, and more! Because of the specific style of this ring, and as different small diamonds were to be sourced and set in the two halos, we enlisted the incredible craftsmanship of gemmologist-goldsmith Michael O’Dwyer. 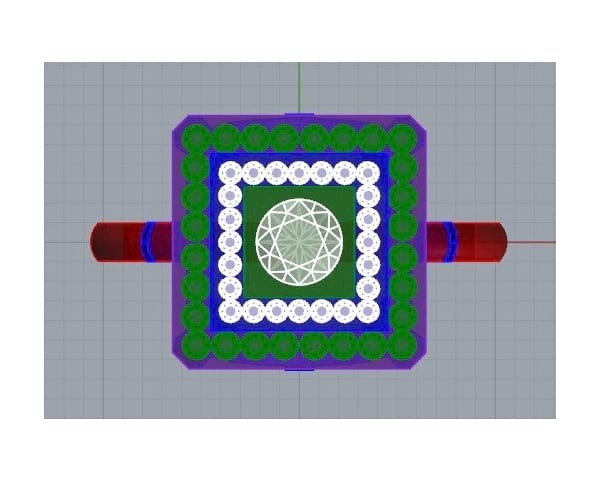 Not all bespoke projects require a CAD (Computer Aided Design) drawing but, in this case, it allowed us to go through everything with our customer to ensure that all the details she was keen on had been captured. We also showed her a wax model of the ring, made to scale, so that she could try it on her hand and see how it was going to sit, look and feel. 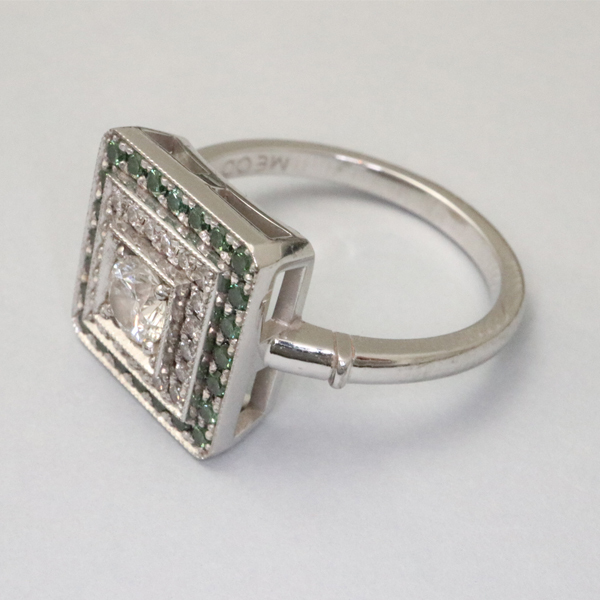 Our customer’s Art Deco ring is made in 18ct white gold and, although every single diamond set in it is round, the overall shape of the ring is square (or octagonal to be more precise!). 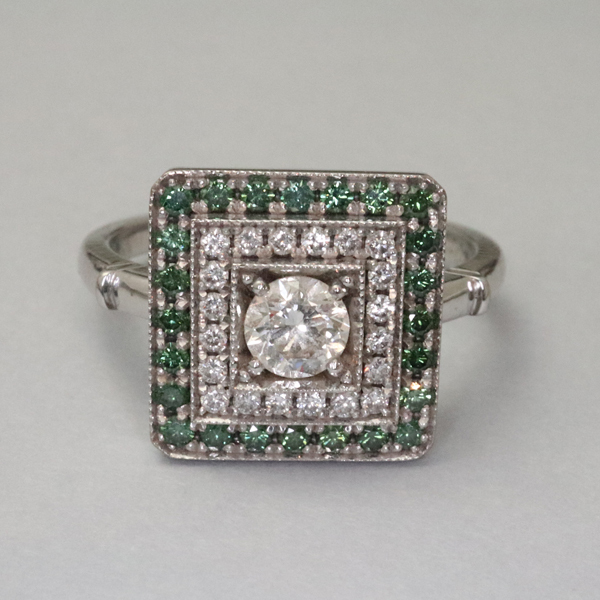 Small white diamonds create the inner halo to surround the centre diamond (donated by our customer’s very kind Mum) while slightly larger forest green diamonds complete the ring, bringing in colour as well as additional sparkle. 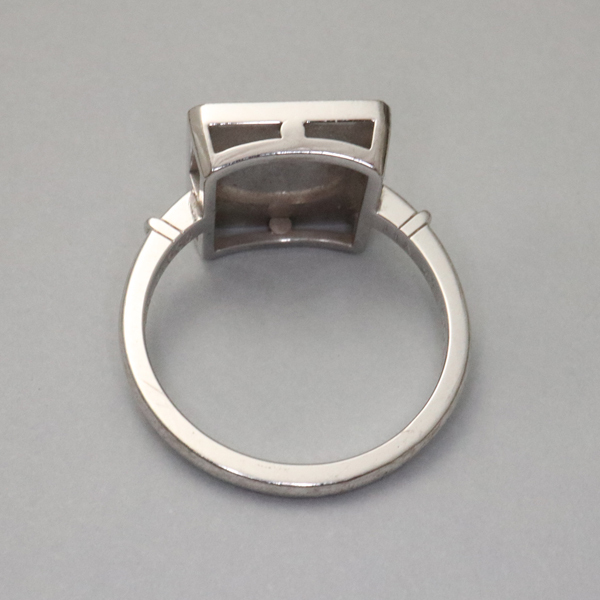 A final and very important detail which enhances the Art Deco nature of the ring is the milgrain finish. Milgrain is the creation of hundreds of tiny “beads” in the white gold which reinforce the truly vintage feel – just beautiful! Created with a relatively slim band and a linear, Art Deco inspired structure underneath the setting, this is an incredible standalone piece. The day our customer came into the shop to collect it was perfect! Her Mum came too, which was wonderful as her diamond is very important in her daughter’s new ring! 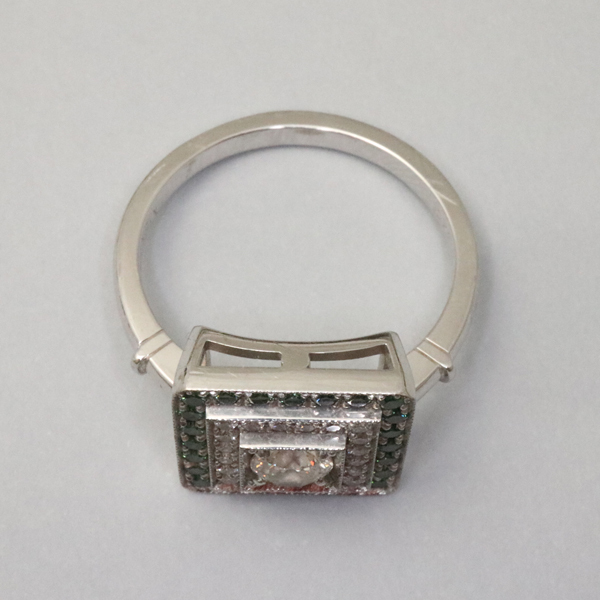 Suffice to say our customer was over the moon and has been wearing her Art Deco ring, and celebrating her big birthday in style, ever since! Small Things Can Say So Much Happy Mother’s Day!